The week of church when our memberships were read into the ward, we went through the usual procedure. They read your names in, you are asked to stand, everyone welcomes you to the ward with an upright hand, you sit, and the meeting goes on. After the meeting was done a lady stopped me. One of those points where you slap yourself for asking a dumb question. My full name is Paul Norwood Jonas Ross. 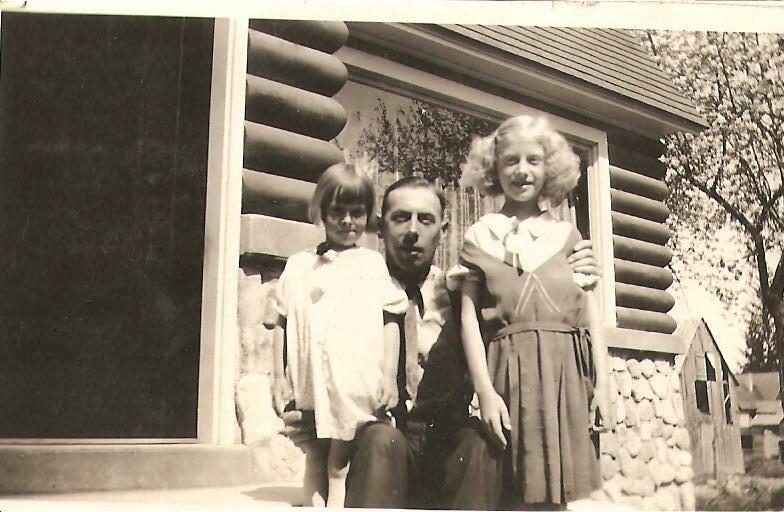 As time went on, we visited about the link between my Grandparents, Norwood and Colleen Jonas, and Gib and Janet Richardson. 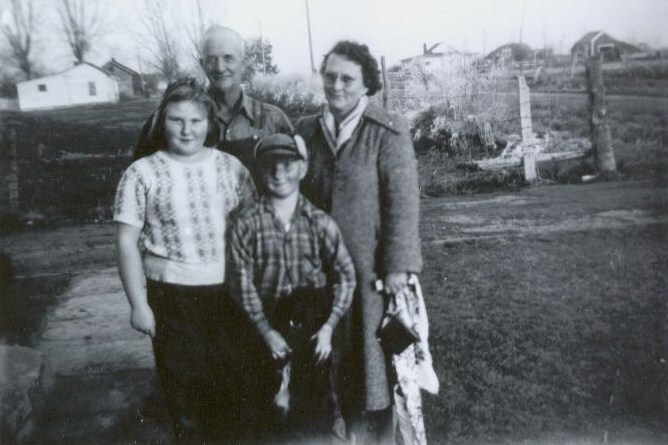 Through a chain of events, my Grandparents had helped bring the Richardsons to Burley, Idaho from Smithfield, Utah. 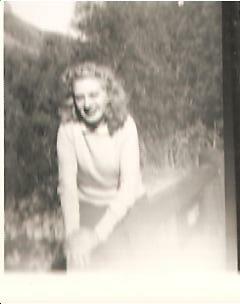 My mother, Sandy Jonas, actually went to school with their daughter, LuAnn, in Utah. Gib mentioned he thought he had some pictures of Grandpa. 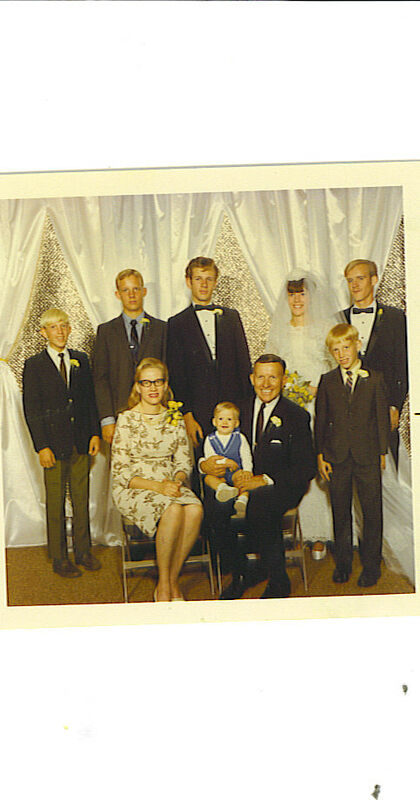 When I met with him and Janet, they revealed that they actually drove all the way to Grandpa’s funeral in Richmond in 1975. 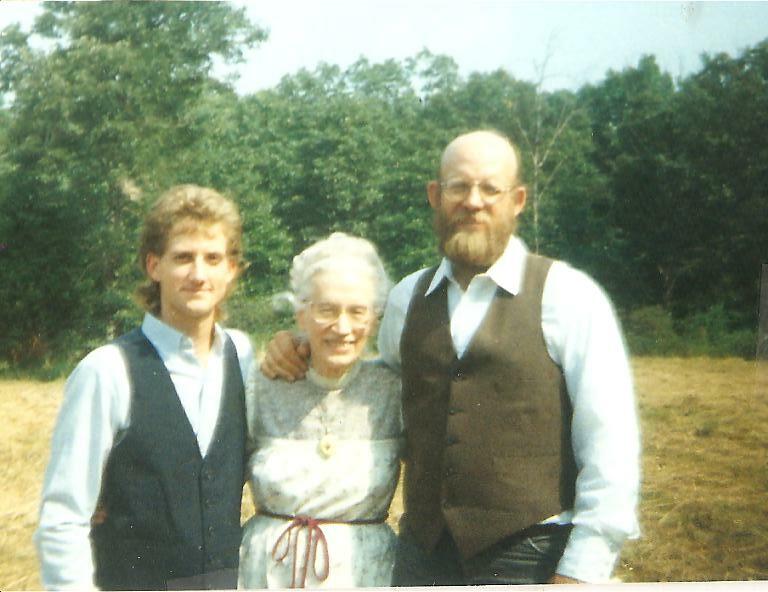 They kept in contact with Grandma through the years and were at her funeral in 1999. 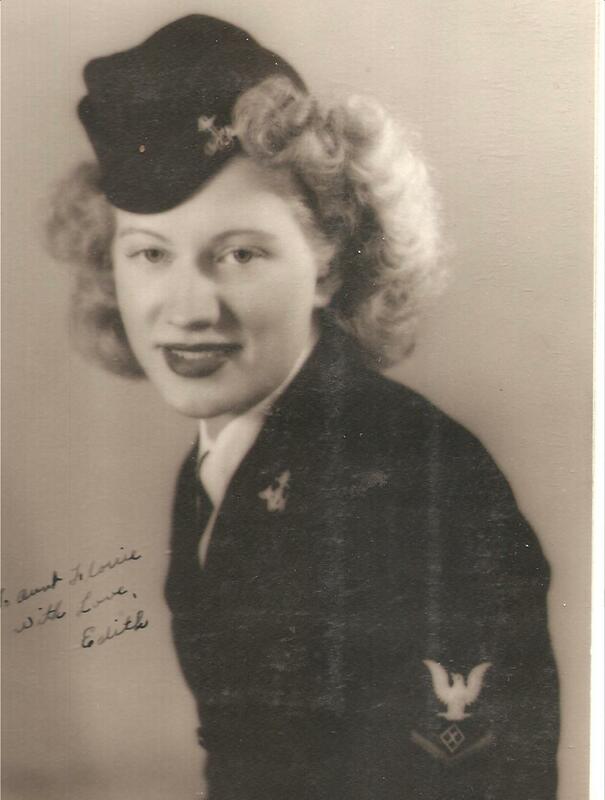 She told me stories of taking my mother to Young Women and other activities with her daughter. Small world! Gib gave me three copies from a booklet, the first of which is above. The Del Monte Shield was apparently a periodical that was produced, I am not sure if it was a one time thing for the opening or if it continued. If it was regular, I also do not know if it was just the Burley Plant or if it was for other plants as well (like the one that was in Smithfield). 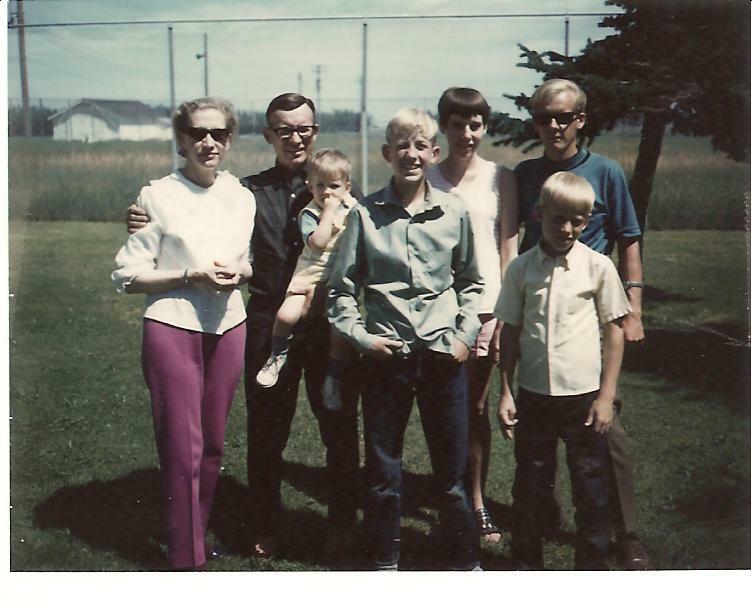 Grandpa is the one farthest on the left for the cover of this booklet. I believe the next person is Sheldon Rawlings, then Ed Carlton (in front), I don’t know the two people immediately behind Ed Carlton, then a Mr. Wood, and finally Jack Woolley. 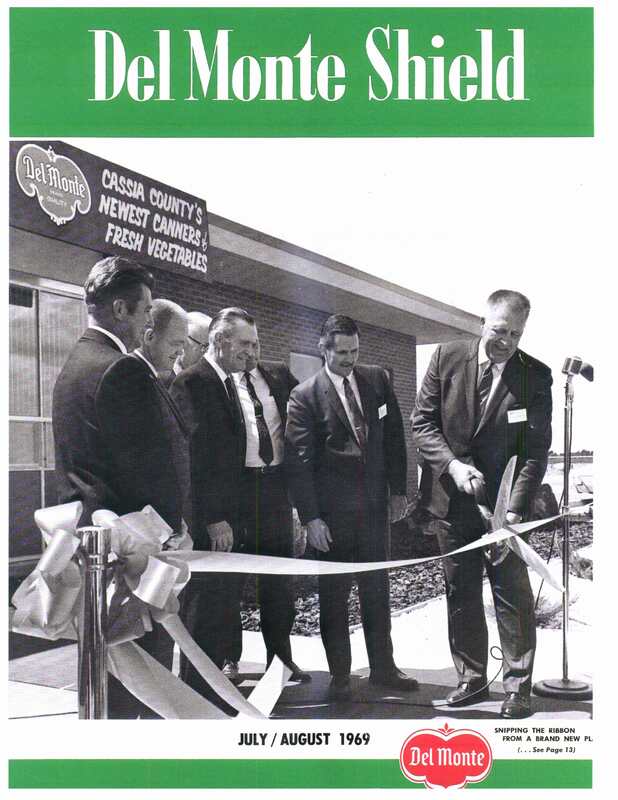 Obviously the date is July/August 1969 and the photo is in front of the plant’s main office building for the ribbon cutting ceremony. 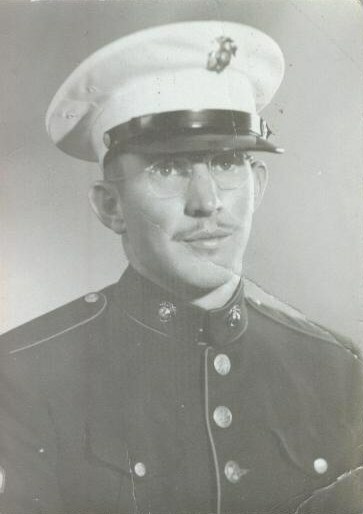 Floyd Edward Carlton, 3 Mar 1914 in Randall, Jewell, Kansas to 8 Jun 1974 in Heyburn, Minidoka, Idaho. Mr. Wood, Unknown to Unknown. I stumbled upon this history of one of Amanda’s ancestors and I thought I would make it available. Maria is Amanda’s 4th Great Grandmother. 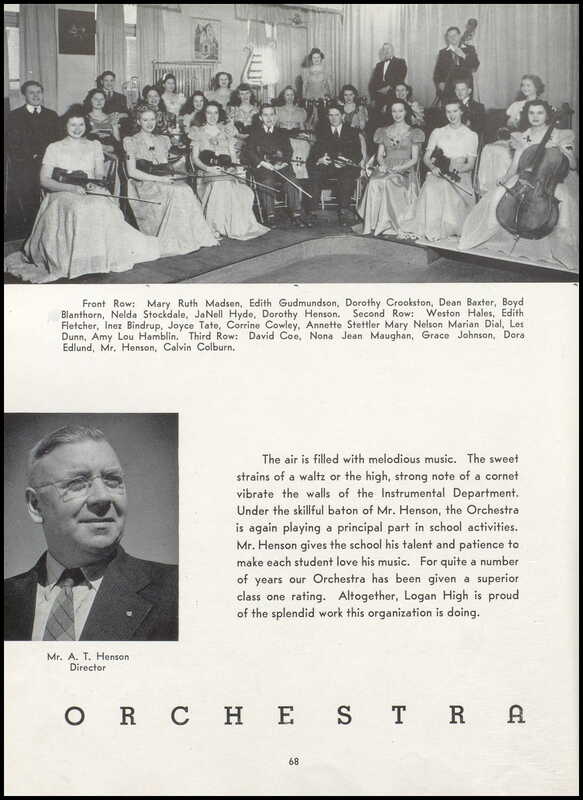 This was compiled by Emma Housley Auger (1895-1969), Maria’s granddaughter. Maria Christina Jacobsen Housley was born in Copenhagen, Denmark, on April 6, 1845. 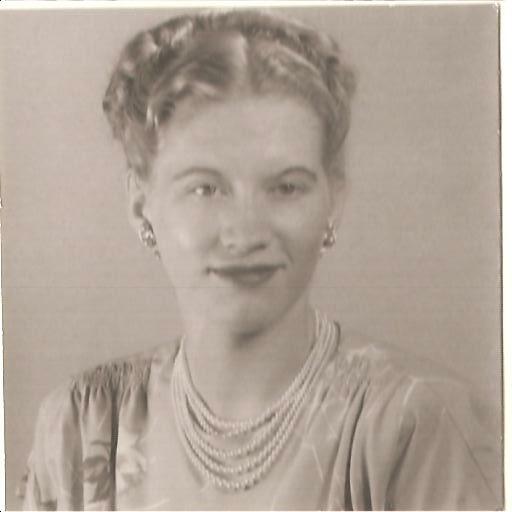 She was the daughter of Jorgen Jacobsen, )born in Svrrup Mill (Feyn) Odense Co. Denmark, on January 20, 1815) and Bertha Kristine Petersen, (born in Vedberks, District of Sol and Copenhagen Amt. Denmark, in the September 16, 1821, the daughter of Hans Petersen and Ellen Catherine Strom). 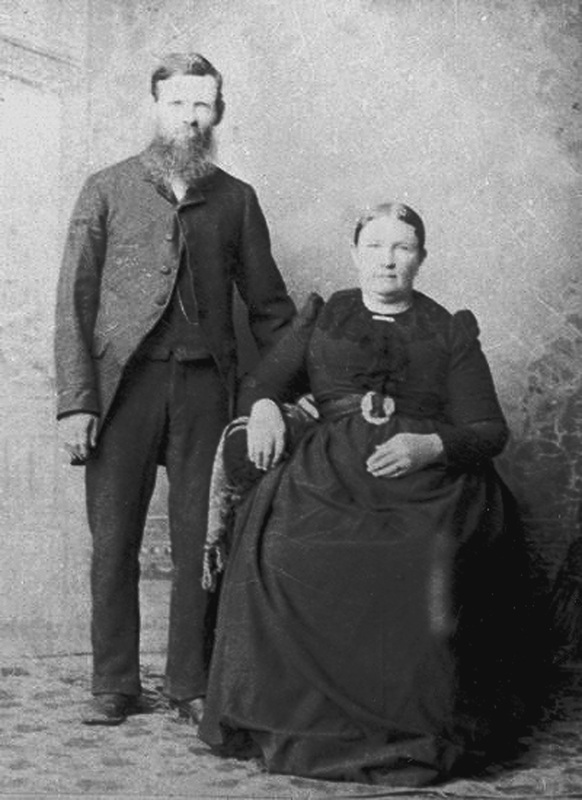 Grandmother had one older brother, Hans, (born April 18, 1844) and two younger brothers Christian (born November 30, 1846) and Ferdinand (born December 28, 1848). Two younger sisters Athalie Hedevine (born March 21, 1851) and Rastime Willardine (born December 22, 1853). 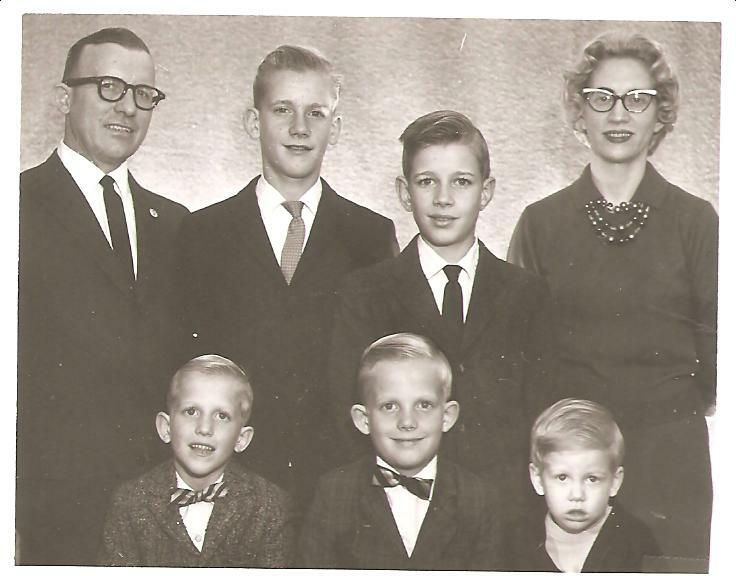 All her brothers and sisters were born in Copenhagen, Denmark. Her parents were married April 9, 1843. They joined the Church of Jesus Christ of Latter-Day Saints on September 28, 1851. Her father was ordained to the office of a teacher on May 2, 1853, and a priest on August 22 of the same year. 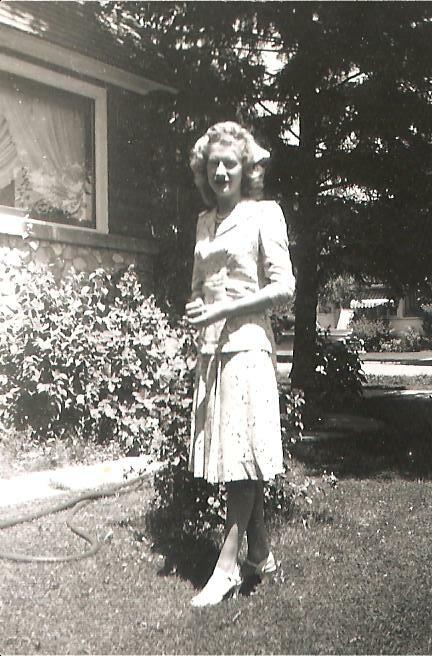 Her father was an orchardist and rented the place that he lived on. This place contained a very comfortable house with several rooms, a yard with outbuildings, a good orchard and gardens. 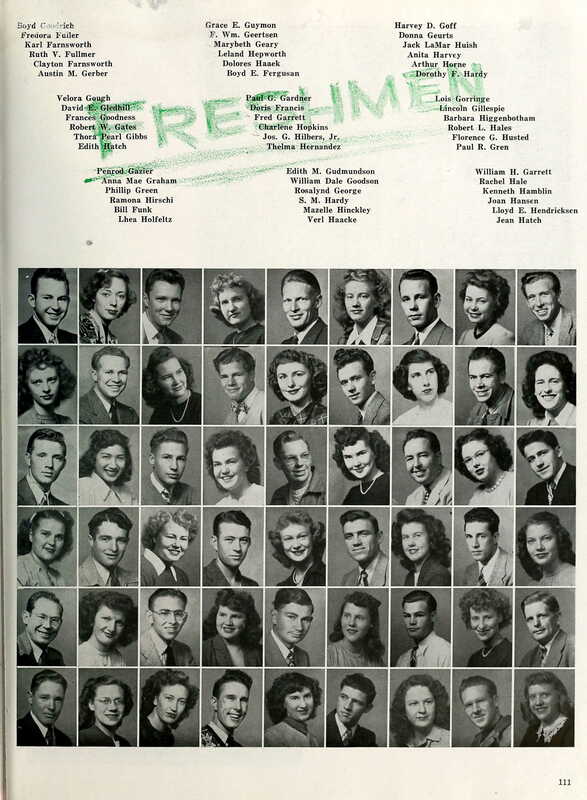 In the year of 1854 with many of their friends, they started their journey Zionward. 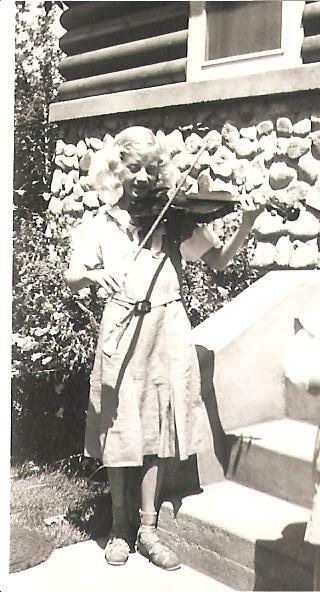 My grandmother, who was nine years old at that time. 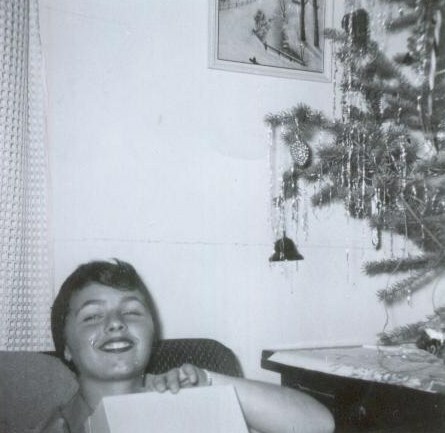 She remembered the day they left their dearly beloved home forever. On reaching the beach, a man came to the carriage side and tried his utmost to induce their father to leave his children in Denmark, even if he had to go to Utah himself. The children were not able to describe their feelings, as the man stood and pleaded with their father on the subject. The very though of any one wanting to separate them from their parents was very exasperating. It was only a short time until they boarded the ship (that was an old vessel). A few minutes into their journey the people began to be sick. This family was no exception. After going part of the way, the ship rocked so hard that it dipped water on the dock. This kept the men working very hard to keep the water pumped off. There was a great deal of sickness among the people on the vessel and a number of deaths. 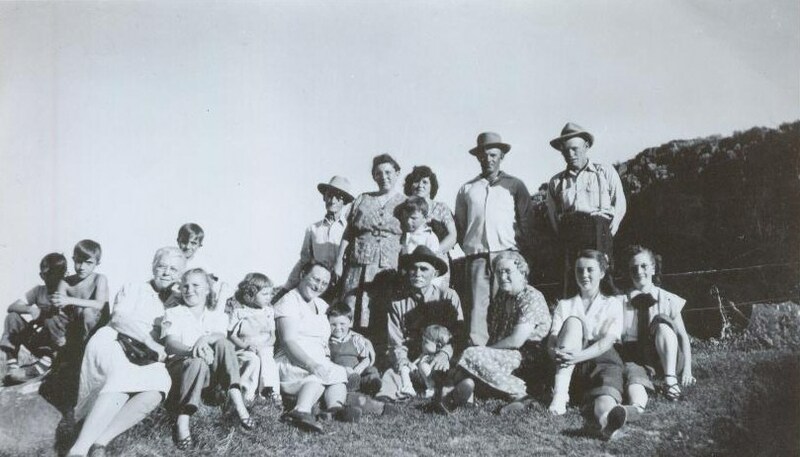 After a long, tiresome journey over the ocean, across the Gulf of Mexico and then up the Mississippi River in a steam boat, this large group of Danish people landed in Kansas. Food had been scarce and they were very hungry. A man who lived there was very anxious to sell them some meat, so they bought some, cooked it. And ate it. Being weak, all the people of the company got sick and many of them died. 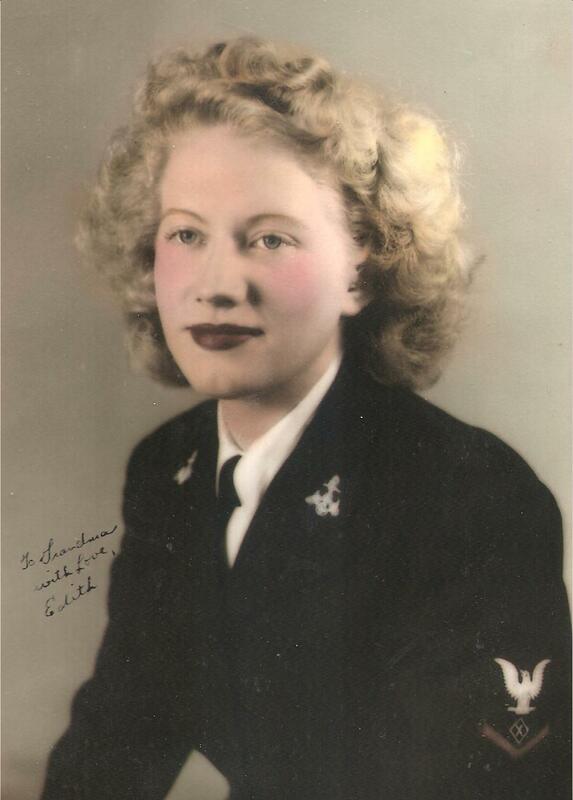 Among the dead were my grandmother’s father, two brothers, and two sisters. After they had eaten and became ill, they learned that the pigs had had cholera so the meat was poison. They could not buy coffins, so they sewed sheets around their dead and buried them the best they could under the circumstances. 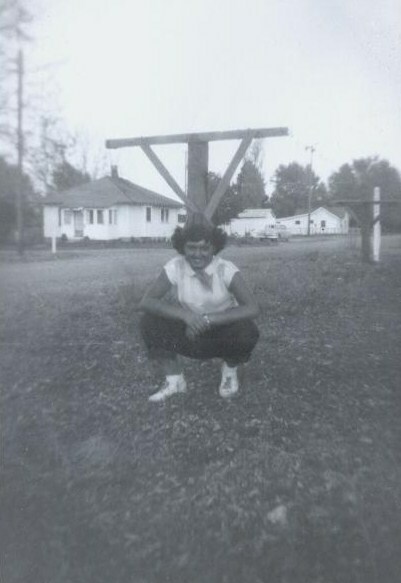 This left my grandmother, Maria, Christian, and their mother to continue the trip across the plains. 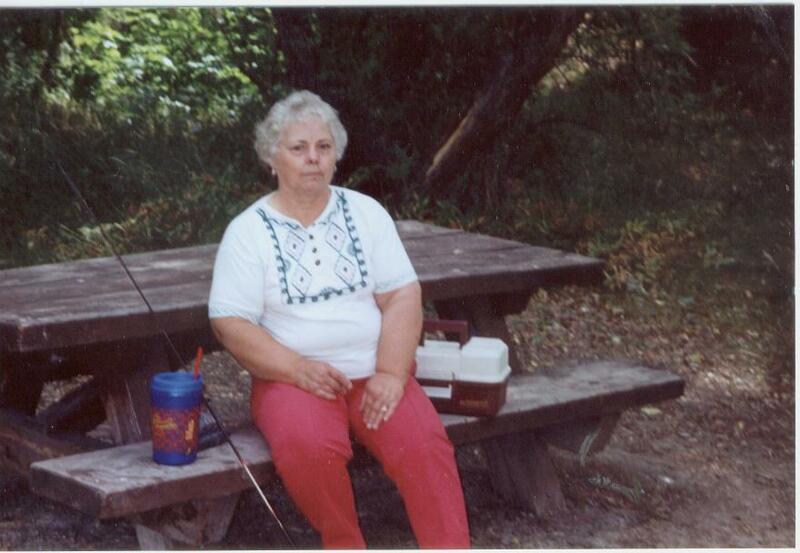 My grandmother, Maria, was very sick, nigh unto death, and her mother almost lost her mind. These were sorrowful days. After a few days delay (for this is all it took for the deaths and burials to take place), they were fitted out with oxen and cow teams. Several yoke of oxen and two cows lead each wagon in an independent company. 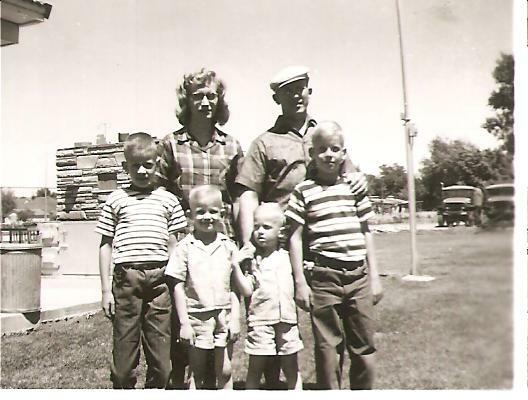 There were generally two families to each wagon. Two men would get on each side of the team and try to lead them on the road. They had several stampedes, for the Daines were not used to driving oxen and the oxen were not used to the Daines. Not many of the, if any, had ever seen an ox until now. They saw a great many Indians and buffalo on their way. They got along nicely with the Indians, and killed some of the buffalo as they came along. They arrived in Salt Lake City in the fall of 1854. 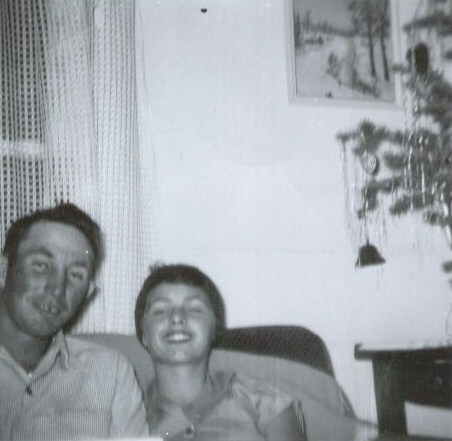 They managed to get some potatoes, which tasted better to them than anything they had ever eaten in their whole life. This family has a hard time making a living. Christian went to work for a man named Jackson Allen in Spanish Fork, Utah. 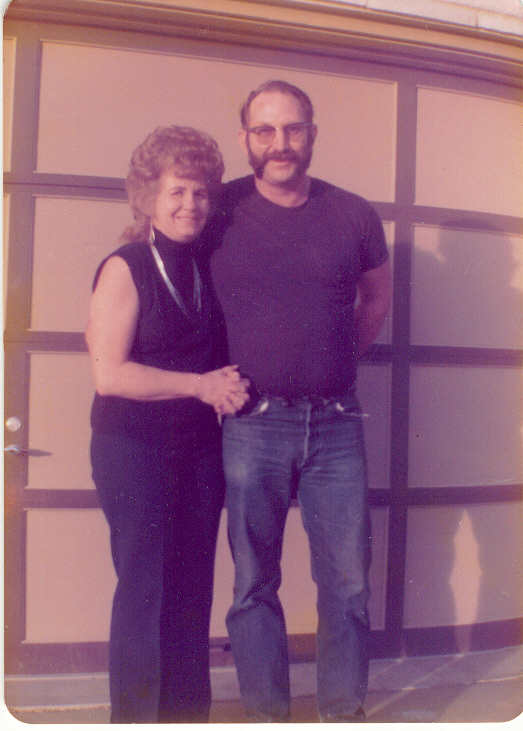 My grandmother lived with an English family who had recently come from England, by the name of Mr. and Mrs. Robert Shipley. She was taken in by this family to be raised as one of their own. She remained with them for about three years. During this time they taught her to read, write, and to speak the English language. They also taught her to do house work and to care for the family. Their children made all manner of fun of her peculiar language. She felt so badly about this hat she prayed to the Lord, asked him to help her forget the Danish language, and she did forget it. She met a young Englishman by the name of George Fredrick Housley. He also lived in Draper and occasionally worked for the Shipley Family. 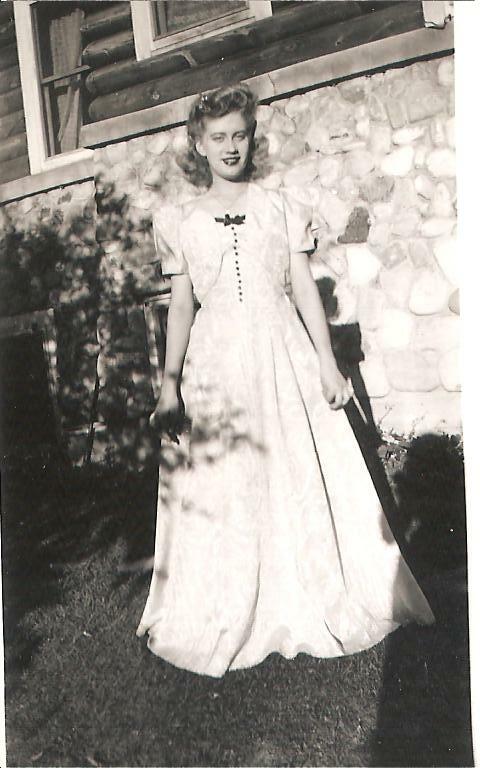 When she was about 14 years old they were married in Salt Lake City. They continued to live in Draper for about six years. On February 22, 1862, they were sealed in the Endowment House in Salt Lake City. Four children were born to them in Draper, two boys and two girls. 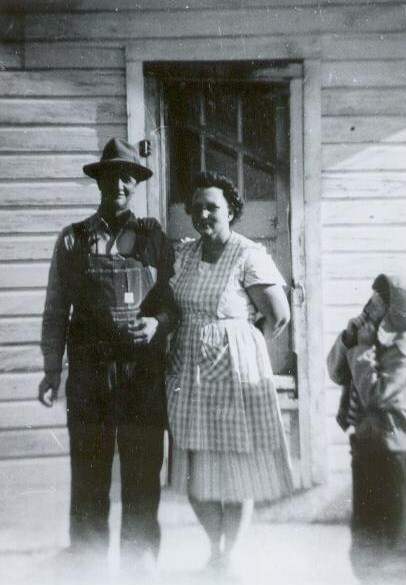 From Draper they moved to Paradise, Cache, Utah, where they purchased a small farm. 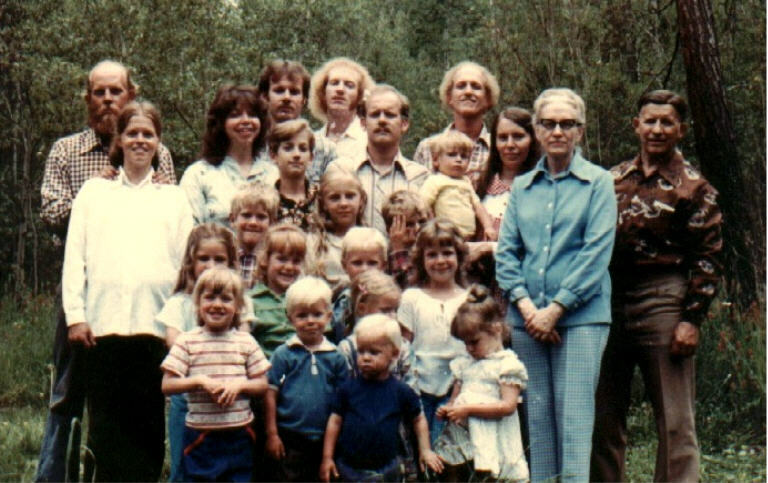 Eight more children were born to them, one boy and seven girls. They were very poor financially and their children had but very little schooling. Most of them went to work while young to help provide a livelihood. The boys worked in the canyon cutting logs and hauling lumber. 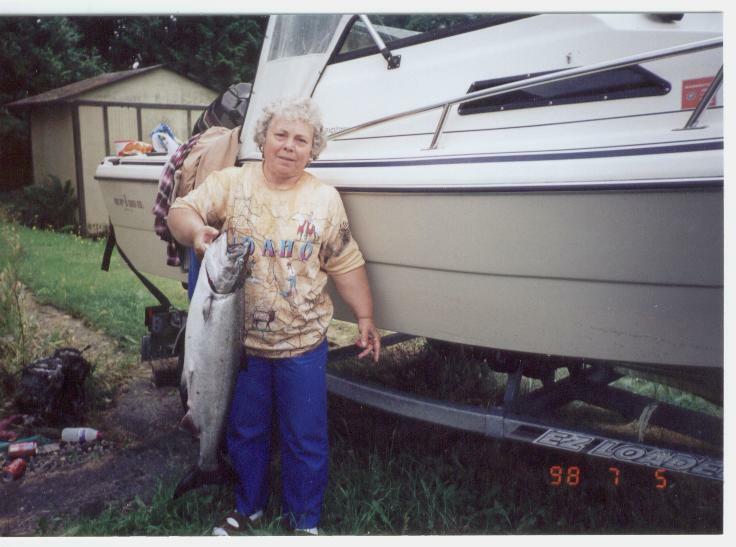 She was a very good cook, some of her specialties, which her family enjoyed most, were “Nofat Dumplings” which were made from veal, pork, beef, and onions chopped together then seasoned with salt and pepper. The dough was made with suet and wrapped around the meat and boiled. “Danish Dumplings” – Heat one quart of milk in a skillet or heavy pan. Stir, while sifting in the flour, until thick. Remove from heat, cool, add two eggs, and a little baking powder. Dip by spoonfuls into boiling broth, cover, and continue to boil for about fifteen minutes. She also made some little cakes out of liver which she called “Faggots”. It was slightly boiled; ground liver with onions, seasoned with salt and sage. Make into little cakes by taking a spoonful and wrapping it in a square of leaf lard or lacy lard which comes from the inside of the pig. Fry just until the lacy lard is golden brown. “Yorkshire Pudding” – which was just eggs, milk, and flour stirred up together and baked in piping hot grease. 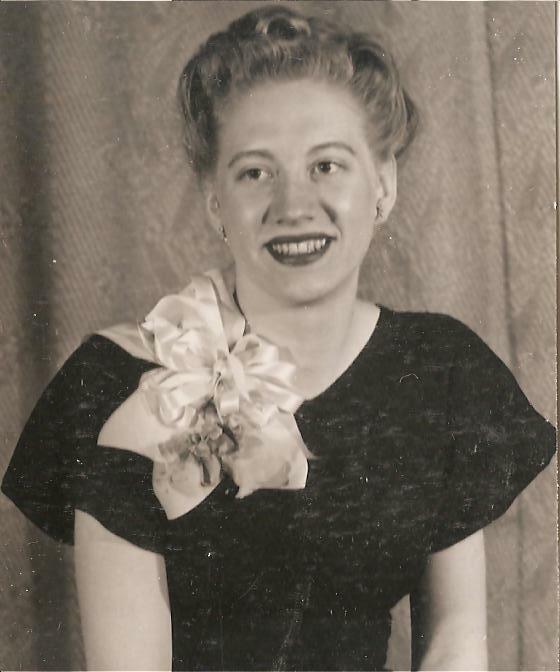 Grandmother was as active in the church as her health would permit. For some time while her husband was away from home, she went without shoes. They think this was the cause of her having rheumatic fever. She went to the Bishop and told him of the condition, he gave her a pair of men’s shoes which she was unable to wear. From this time on she had a weak heart and then dropsy. 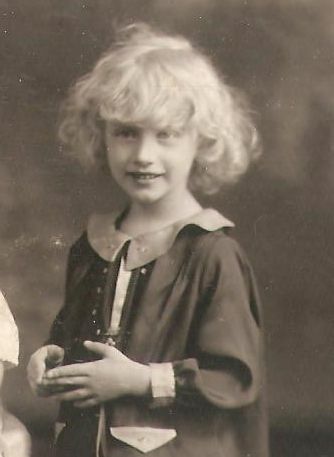 A lot of the time after her sixth or seventh child was born, she was unable to walk, nevertheless, she was quite cheerful and taught her children from a bed or a chair. She passed away in March, 1896, of dropsy at the age of fifty-one. After she was placed in the coffin, she continued to bloat until her body burst. The undertaker tapped the coffin and set a bucket under it to catch the water. The bucket had to be emptied a time or two during the funeral. Burial was in the Paradise Cemetery beside her infant daughter, who preceded her in death. 1957 Utah American Legion Baseball Champions. 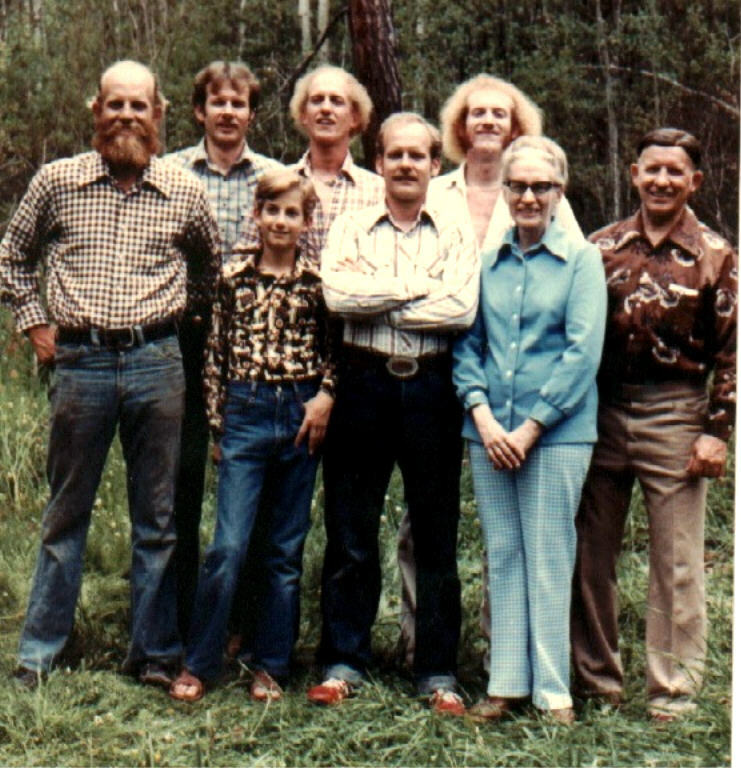 Back(l-r): Ellis Jonas, Lionel Benson, Jed Pitcher, Ken Chambers, Larry Federico, Bruce Pitcher, R.L. 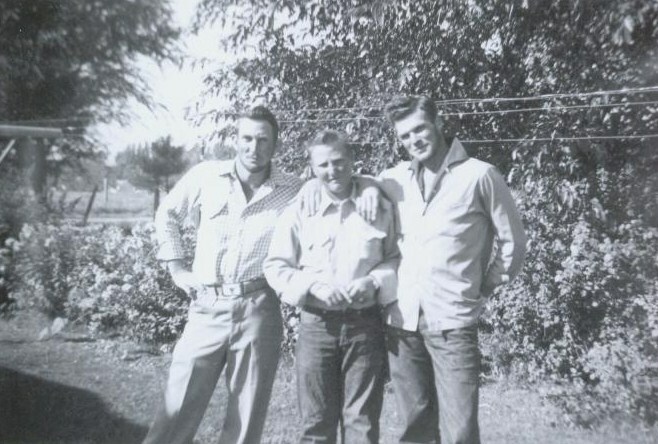 Pitcher, Joe Watts, Richard Lamb, George “Dutch” Reese. 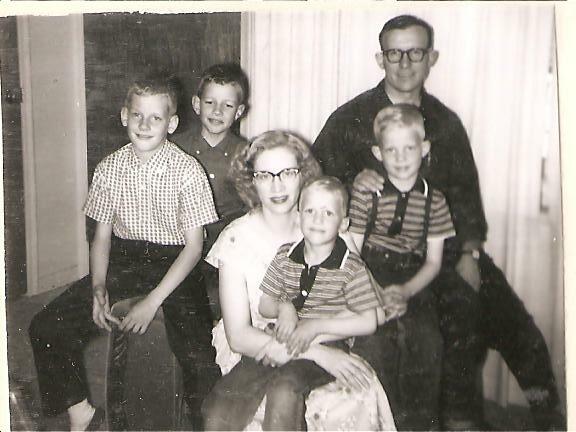 Front: John Hale, Glade Mather, Robert Eliason, Jim Mack, Doug Brinley, Vernon Rice, Brian Thornley, Lee Burke. 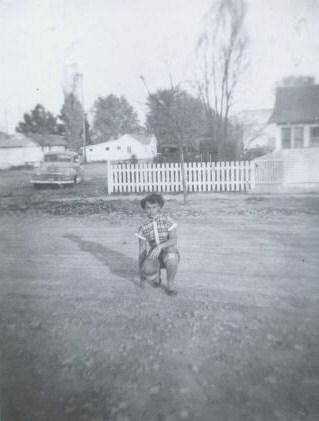 This is a photo that was handed out at Uncle Ellis Jonas‘ funeral. I thought I would make it available. The photo is of the 1957 Smithfield American Legion Team. This photo was taken at the Regional Tournament in Winslow, Arizona. The 1957 Smithfield American Legion Team had won the Utah State Championship. 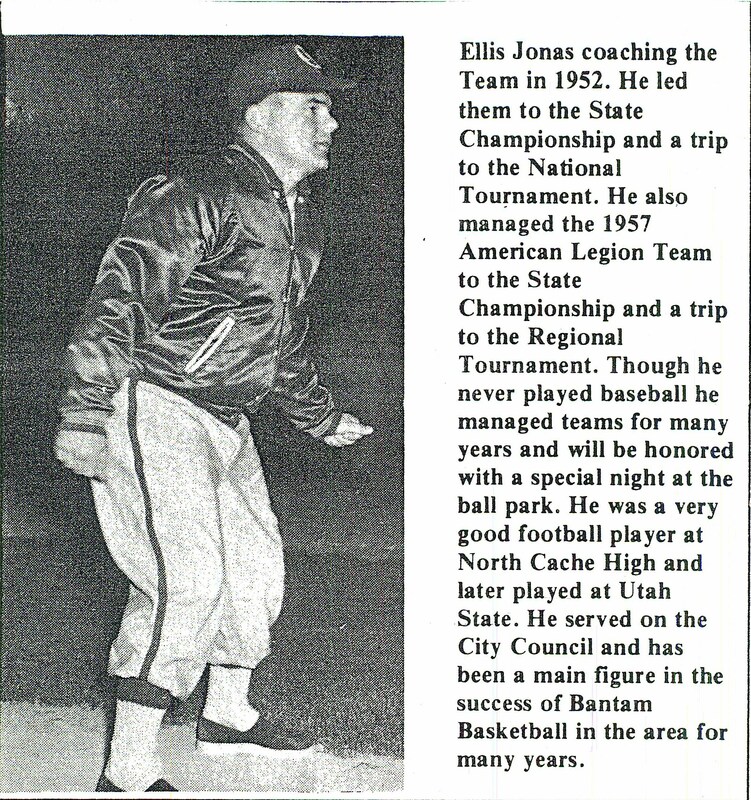 Ellis Jonas is listed as the manager and George Reese is the American Legion Representative. 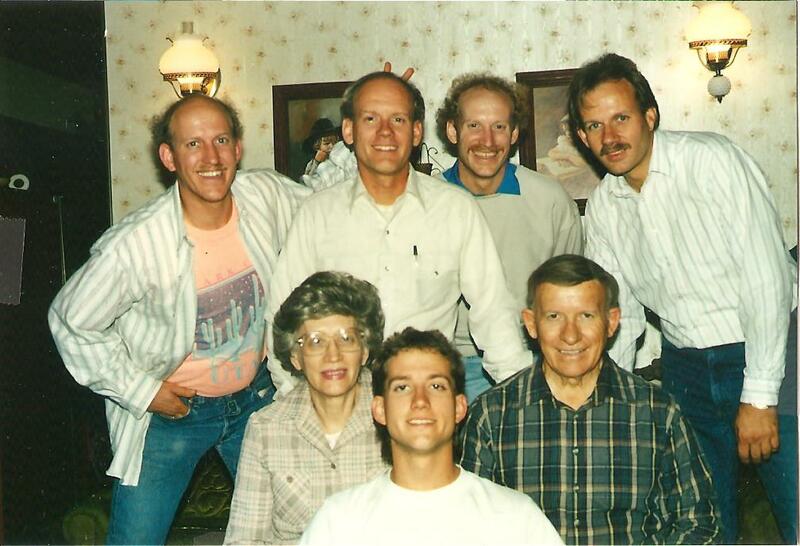 Absent from the photo are Terry Griffen, Brian Toolson, Todd Peterson, Ferris Groll, Charles Wood, Mark McCraken, Ned Gylenskog, and Claire Nielsen. The following photo is of the 1952 Smithfield American Legion Team. This photo was taken at the National Tournament in Wichita, Kansas. 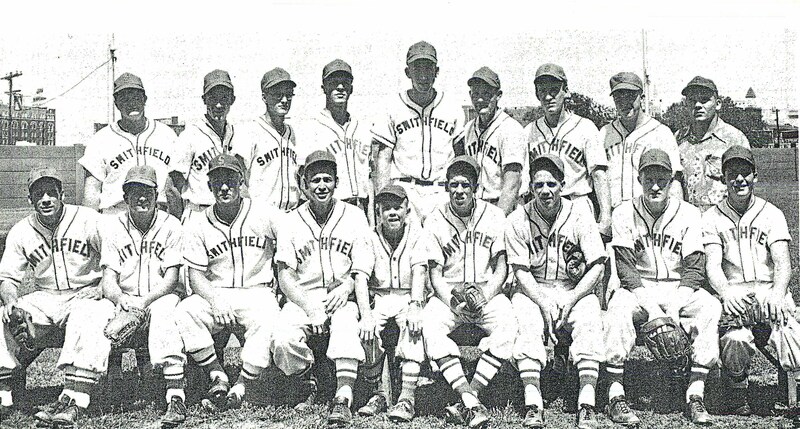 The 1952 Smithfield American Legion Team had won the Utah State Championship as well as the Regional Tournament. 1952 Utah American Legion Baseball Champions. Back(l-r): DeVon Britenbeeker, Royce Lumberg, Jon Hyde, Erle Reese, Reese Naegle, Jerry Hansen, Richard Hodges, Hal Jensen, Ellis Jonas. Front: Darold Whatcott, Ralph Tresedor, Cleon Hodges, Ross Godderidge, Jerry Coleman, Ferrell Karren, Ralph Roylance, Kay Inglet, Jack Reese. Ellis Jonas is listed as the manager and Jerry Coleman as the bat boy. Lastly, here is a little insert regarding Ellis as the coach. I think it speaks for itself and his regard in Smithfield. For Evan’s birthday, and since he provided me some photos and I do not know what else to do with them, I will post them on here. 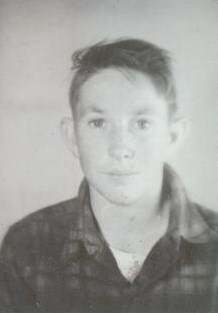 He is not technically my relative and I have held on to the photos because he knew I did family history and would make them available to family. 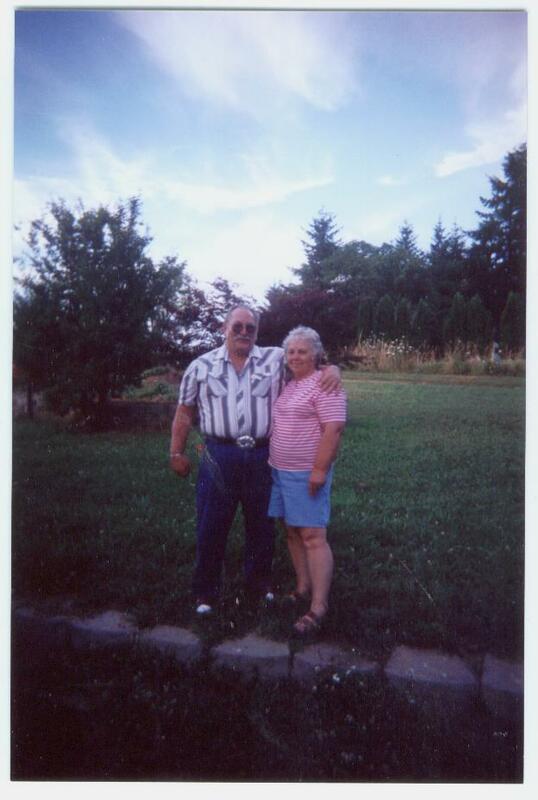 He provided these photos to me in the summer of 2004. 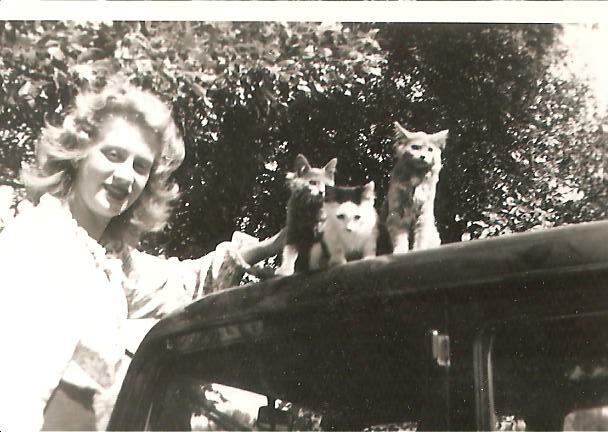 I scanned them and have kept them safe since them. These are all the photos he provided for me. 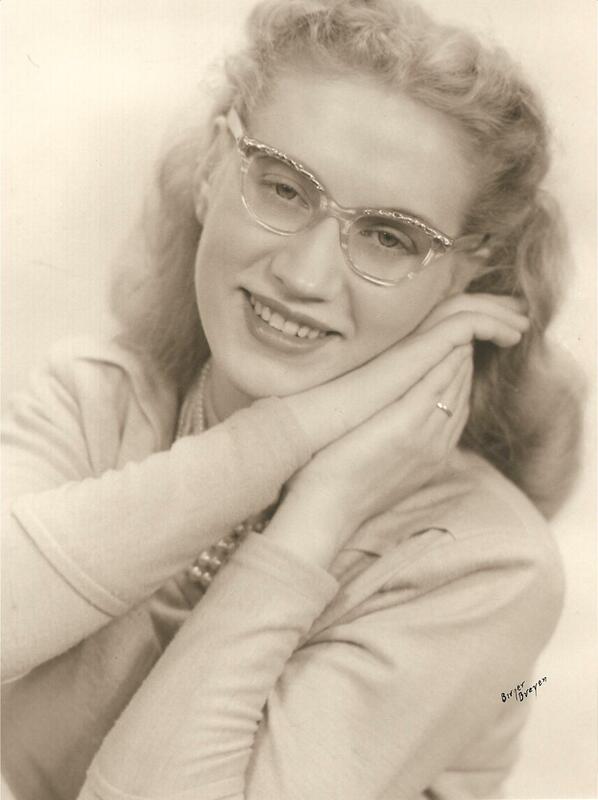 I am including a few others that I have that include my Grandmother, Colleen. 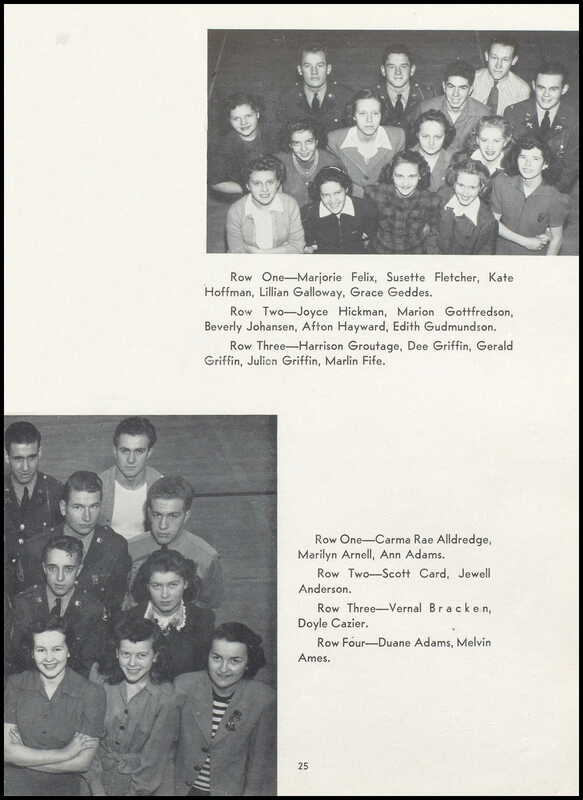 I do not know the status or whereabouts of any of the other individuals in the photos. I have put them in chronological order as much as I can. These individuals are named as Evan gave them to me. 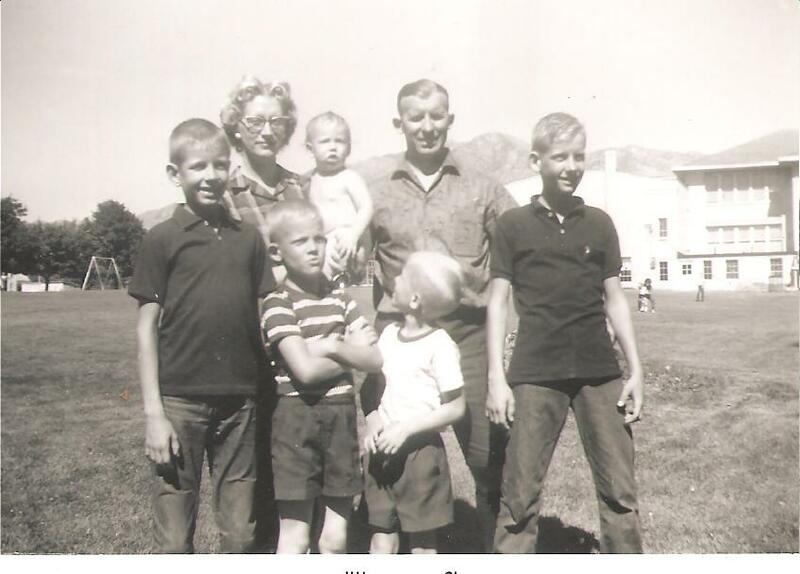 Evan Kay Elliott was born the fourth of six children on 19 June 1934 to Ethel Helen Heath and William Henery Elliott in Soda Springs, Caribou, Idaho. 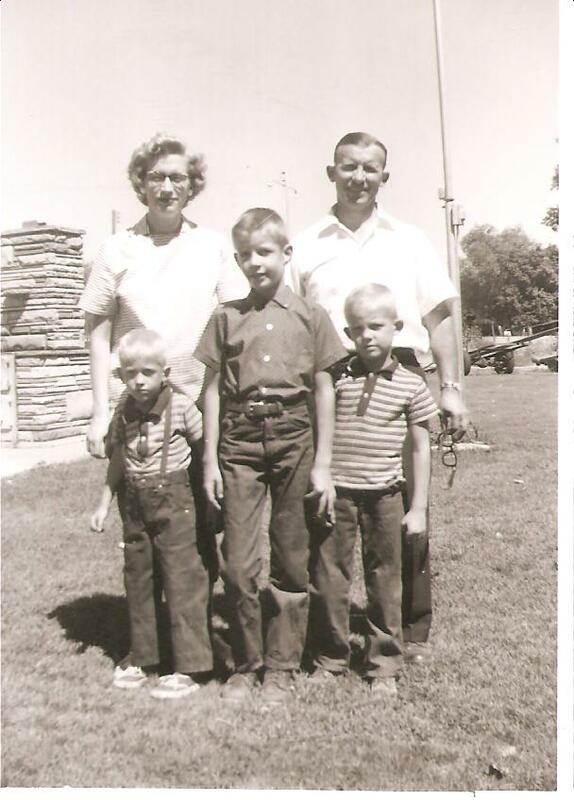 His father was born in Lago, Bannock, Idaho (now Caribou County) and his mother was born in Liberal, Seward, Kansas. He graduated from Paul High School. 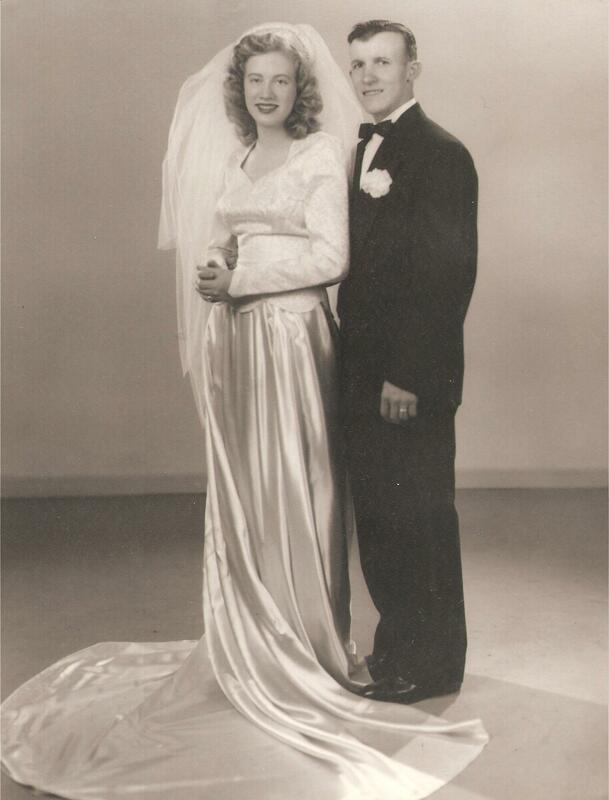 He married Beatrice F Lamoureau 9 May 1961 in Elko, Elko, Nevada. They were divorced shortly afterward. 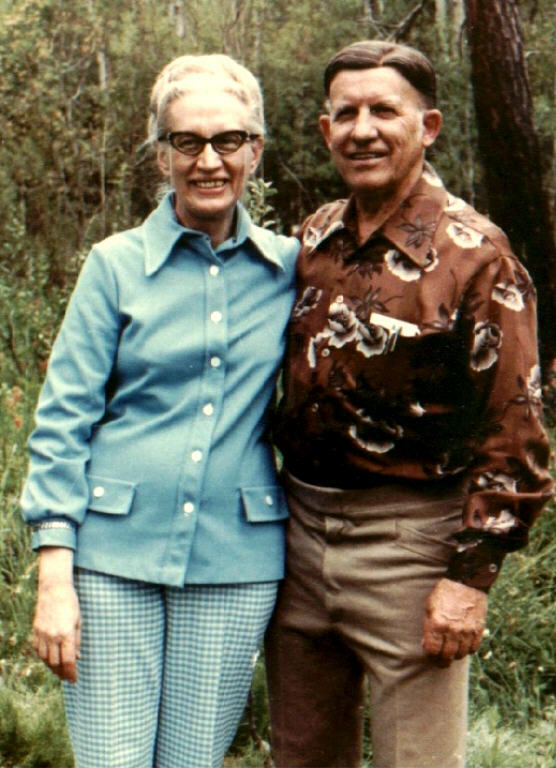 He married Colleen Mary Andra, a widow of Wilburn Norwood Jonas, 9 April 1976 in Burley, Cassia, Idaho. 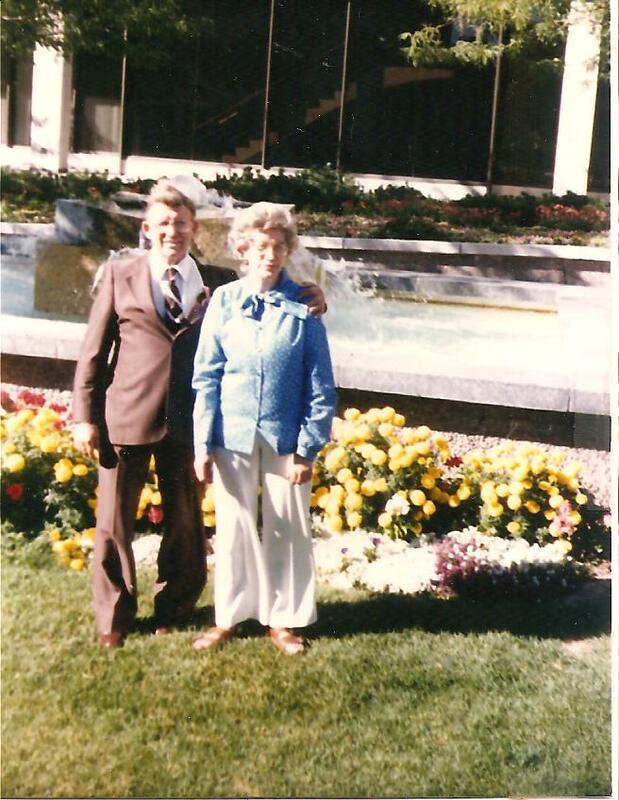 They were later sealed 5 May 1978 in Idaho Falls, Bonneville, Idaho at the Idaho Falls LDS Temple. They were divorced about 1987. 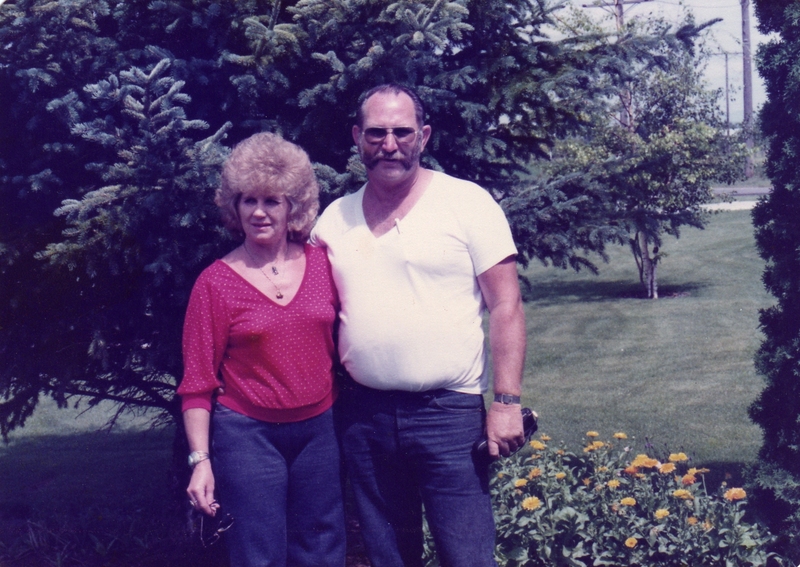 He then married his high school sweetheart, Shirley Jeanette Loebsack, 6 April 1989 in Elko. 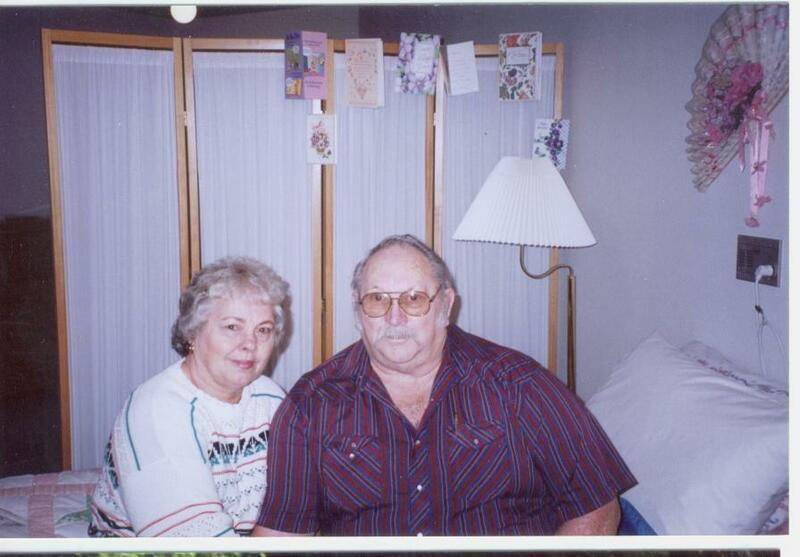 They lived together until she passed 30 September 2003 in Twin Falls, Twin Falls, Idaho. 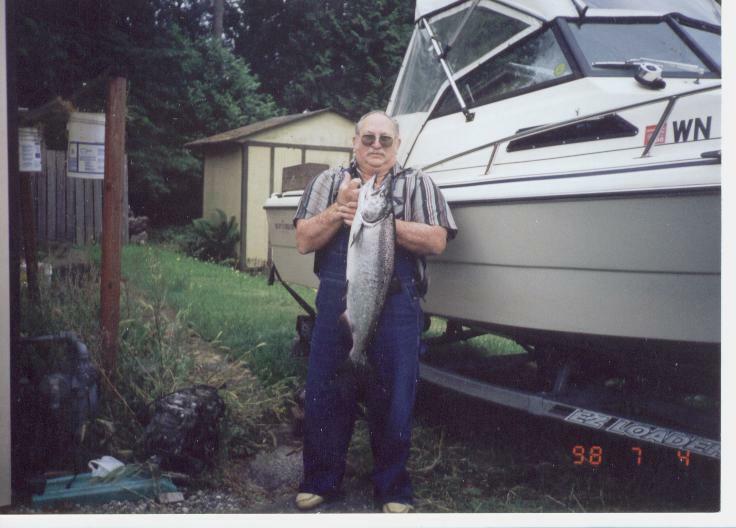 Evan lived alone until he passed at home in Twin Falls 24 October 2007. 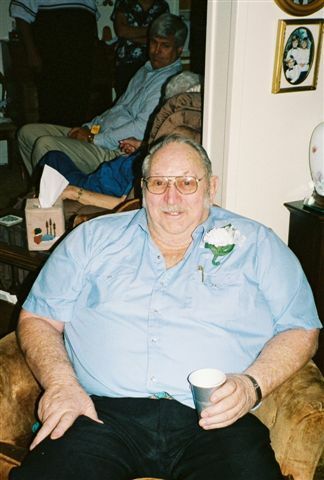 He was buried 3 November 2007 in Paul, Minidoka, Idaho. 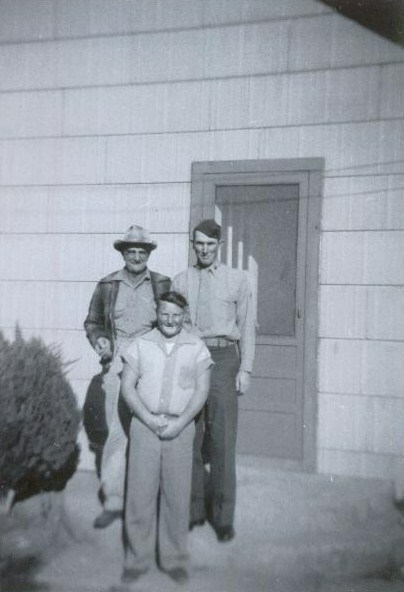 William (Bill) and Ethel Helen (“Helen”) Elliott with son Melvin standing on their doorstep in Paul, Idaho about 1947. 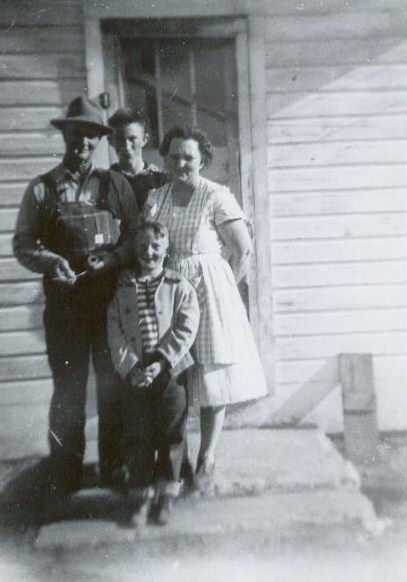 William (Bill) Elliott with wife, Helen, and sons Evan (back) and Melvin about 1947. 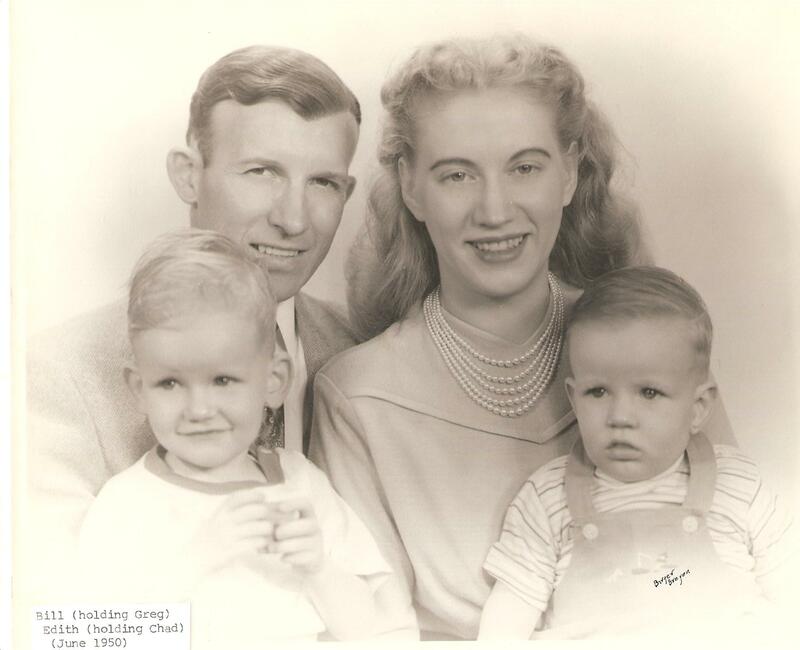 Bill and Helen Elliott with daughter and son, Carol and Melvin about 1947. 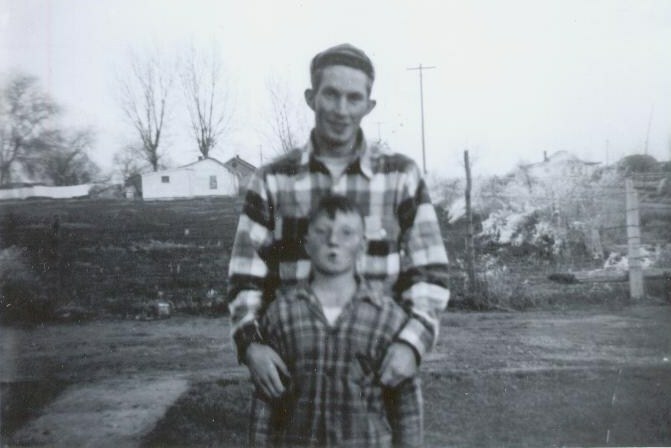 Evan and Melvin Elliott, his brother, about 1947. 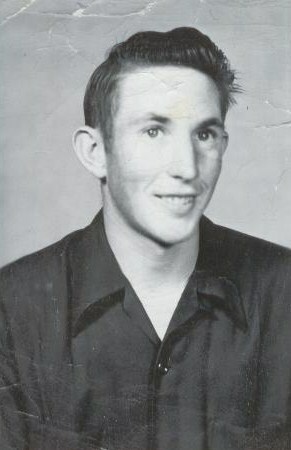 Evan’s military photo, about 1951. He served in the Korean War, I believe in the Navy. 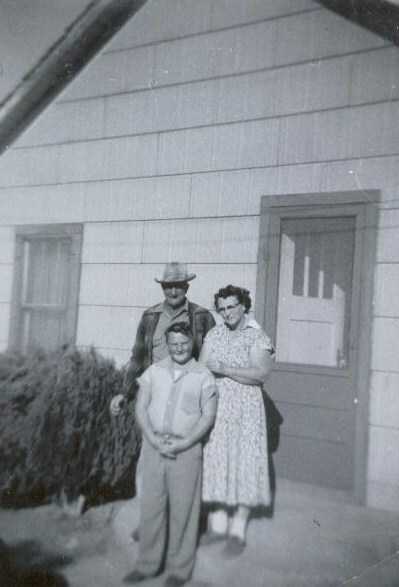 Bill and Helen Elliott with Melvin. 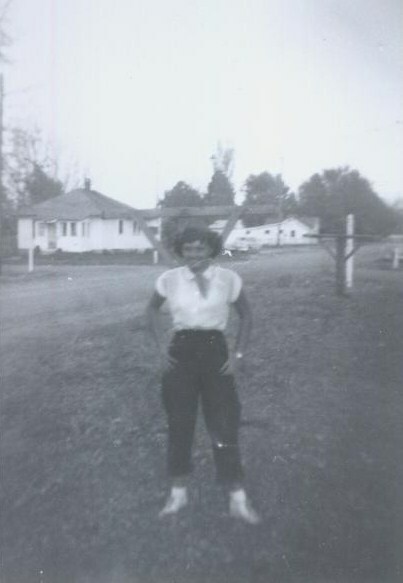 Loucilla Loebsack, 1953, Shirley’s sister. 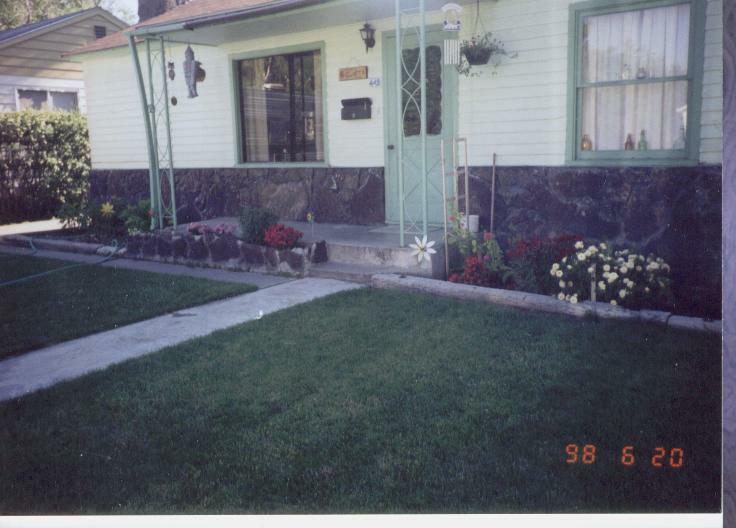 The Elliott home in Twin Falls. Another week has passed and things constantly change and go. Sometimes I have to laugh at how quickly the world seems to change. One moment one thing is happening, the next moment all new circumstances have arisen.One month ago, Amanda and I were not in Virginia yet. In fact, we were driving through Kansas and would be arriving in Missouri. A week before that, we were comfortably situated in our little apartment in Provo, Utah. Had not even started packing yet. One year ago, I was unmarried, living and working my life away in Boise, Idaho. I had a wonderful job during the week working for The Gallatin Group, and on the weekends I sprayed lawns in Malad, Idaho. Seven months ago and eleven days, I was married in Logan, Utah. Put me at seven and half months ago, I was working on Capitol Hill in Washington, DC. Now another chapter of sorts is beginning, or at least a sub title. Today Amanda officially starts at Virginia Commonwealth University in the dental hygiene program. It was strange to drop her off at her ride’s home, and come home alone, to realize she is now a student again. Oddly enough, Matthew and Sarah Harris are one of the individuals who Nathan Wayment’s e-mail passed through in its line before us for which we were able to secure this huge home to live in. Another chapter opened on Friday when I went in to take the Virginia Health Insurance Licensing Exam. I had spent a whole week in class preparing to take the test, and there I was, taking it. I really don’t know what I expected, that it wouldn’t come? It did, and I squashed it! So, now I have certification to be licensed for health insurance in Virginia. Now, I head off to Raleigh, North Carolina for two weeks of training so that Combined Insurance of America can appoint me. Then after appointment, I will receive my actual license from the state. Then I will be bonified and legitimate to be selling insurance in this state. 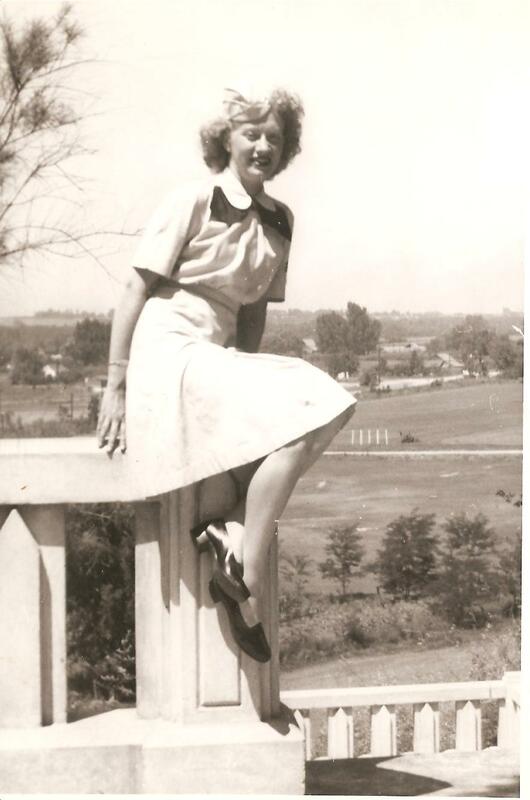 Carrying on in a company of which my Grandmother invested 30 years of her life. Too bad I could not take her residuals! Life marches on, it continues to amaze me, and go forward. One day it seems that I have enjoyed and endured all I wanted in life, and then another magnificent vista opens before me. Endured not because of pain and torment, but because it just seems my bosom could not contain anything more. My, our, blessings are beyond comprehension. At some points in life, I feel my heart has swelled as wide as eternity and could not possibly take any more. Pain just isn’t an option any more. It is so low, so mean, so vulgar, and something only to distract our mind from the real view. The past weeks I have recognized blessings which have come to me which have been in the pipeline for generations. 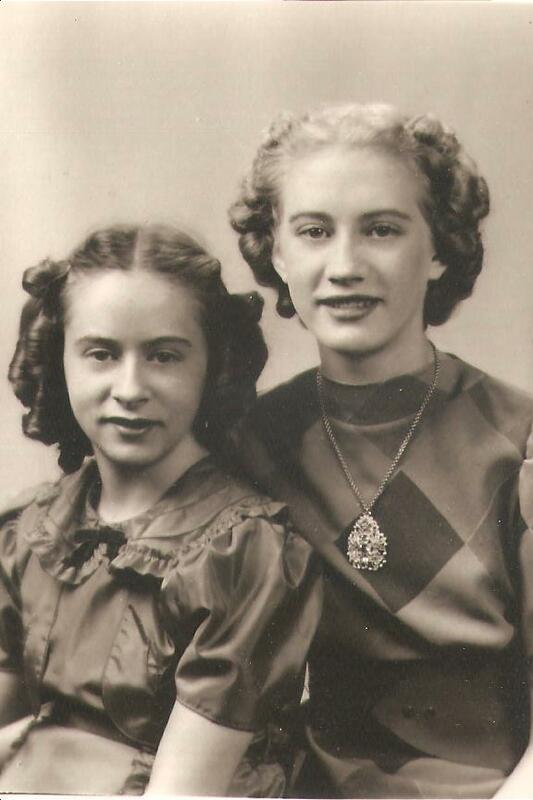 I recognized blessings that come to me from my Great Great Grandmother Christiana Wilhelmina Knauke Andra. I also stumbled upon one that has passed to me from Regina Friederike Nuffer Scheibel Wanner. 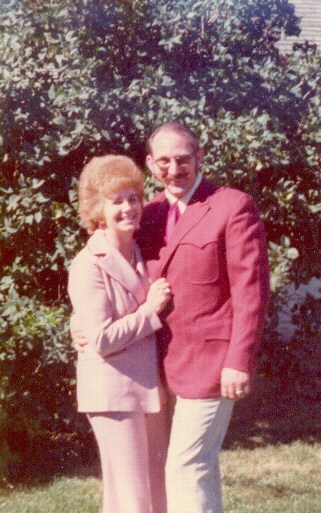 Just this week I had one fall in my lap that came from Herbert and Marthan Christiansen Coley. Who would ever have thought that the faith of these individuals would reap and bestow blessings on those who they only could imagine. Well, time to be doing something more. All is according to plan, as far as I can see. Another day of traveling. We left Parker, Colorado and have arrived safely in Kansas City, Missouri. 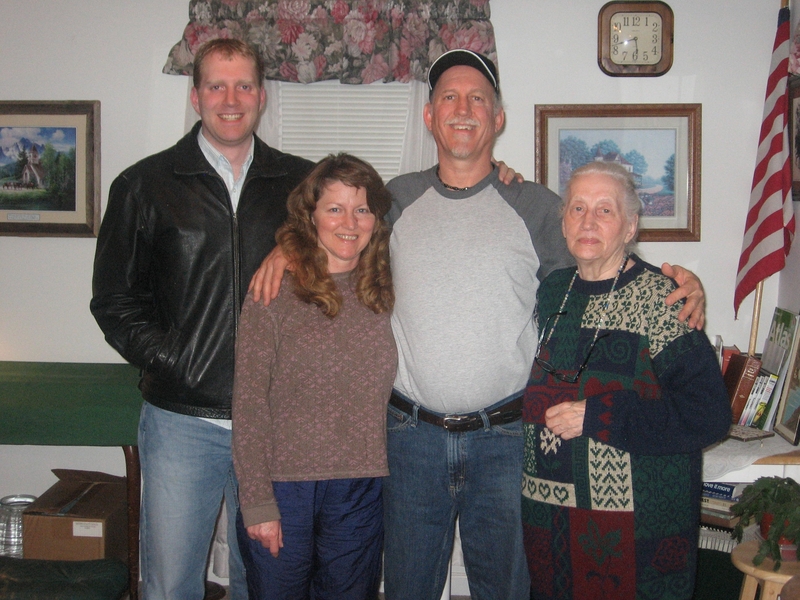 We have met up with Joseph and Alyson Shepperd who are currently living here. It has been good to visit with them. Also met with Mike Stokes for a short visit and introduction. He is not related. Anyhow, made a stop in Abilene, and sang the song. It was great. In Kansas City we sang “Everything is up to date in Kansas City”, and the classic Kansas City. Otherwise there was not much to tell but that we cross the whole state of Kansas.